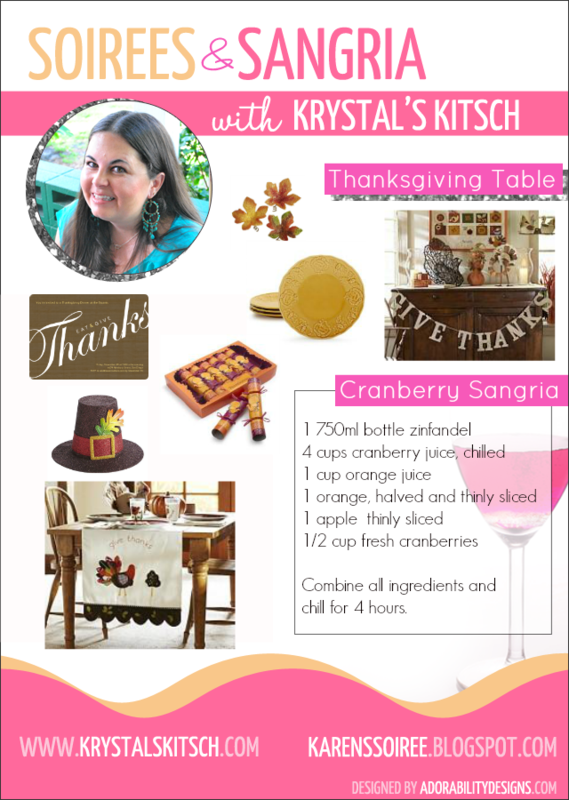 It’s been a busy week over in my world, but I took the time to create the following Thanksgiving Table Ideas with Karen’s Soirees. See how she styled her table in her post, but here are my ideas: Keep scrolling for a free Thanksgiving Place Card Printable. And, now, for something extra! Karen designed the last printable in this series so it was my turn to whip up something. Here is a place card printable created by the amazingness that is Pic Monkey. Simple and efficient! I added thankful quotes to the printable, and I really like how they came out! It’s blank with leaves and quotes. You can either print it as it and handwrite names OR open it in PicMonkey and add your own text! I used Bilbo Swish Caps for the example above. This Healthy Thanksgiving Guide will walk you through how to navigate the season making better choices and cooking delicious dishes without a lot of fuss. I’ll have to modify that sangria recipe since I’m allergic to cranberry juice, but thanks for sharing and for the free download. Have a fabulous weekend. Love the idea of a Thanksgiving place card! These are really cute ideas! Thanks for sharing! These are fantastic! I love all decorations for Thanksgiving and this is giving me some ideas! I love the place card idea! How cute! Most people overlook Thanksgiving decorations & like to rush right into Christmas. I love these place cards. They are PERFECT! Thank you for stopping by http://www.recipesforourdailybread.com FABULOUS FRIDAY BLOGGERS LINK UP. Blessings! Cranberry sangria??? That sounds amazing! I’ll have to try this recipe soon. Krystal, I love the place card! and that sangria sounds amazing! Definitely pinning. Thanks for sharing all these wonderful ideas! I love your place card, so simple, natural and beautiful! I love your ideas and those printable place cards are GREAT! Thanks for sharing on today’s Daily Blog Boost! Off to pin your greatness! Ohhh some great ideas and projects….thank you for sharing. Oh, what great projects and ideas for the upcoming holiday! 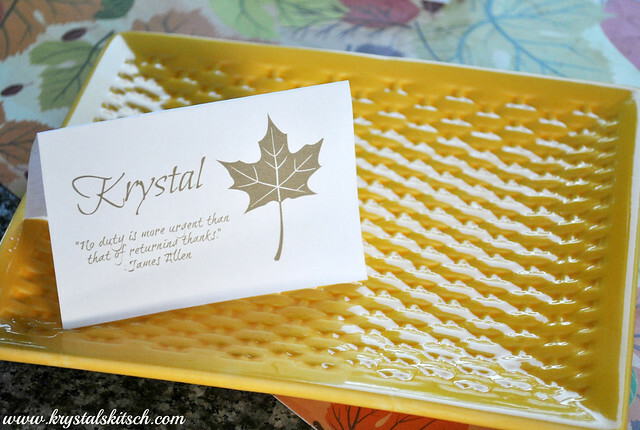 I especially love the printable place cards, and if we were hosting Thanksgiving this year, I’d be printing ’em out now! Hope you’re having a great weekend! Love it all! Thanks for sharing- THIS is one of my favorite series every week! I’m going to share the printable place cards for sure! I’m not hosting this year, but, I think they’re adorable! Great projects! I especially love the place cards! Visiting from Sharefest – hope you can take a moment to visit my blog! I love it, and great decor too! Thanks for sharing it at Friday Pin Fest! I want one of those Give Thanks banners….I need some more Thanksgiving decor at my house. Yum – saving that recipe!! Such great ideas, thank you! We need to get my house decorated for Thanksgiving, I’m hosting my first this year! Awesome ideas! Love the place card and recipe! Thanks for sharing! Thanks for the cute ideas and free printable! I have never seen Thanksgiving crackers! Fun! I found you on Sunday Fun Day. This is a cute idea! Thanks for sharing at Share Your Stuff Tuesdays. The place cards are adorable. They’re sophisticated without being too over the top. The free printable is a good touch to add to any post. I need to learn this so I can put one on my blog soon. Thanks for sharing! Oh they’re beautiful! Im sure your thanksgiving is going to be lovely. This is so lovely and perfect for Thanksgiving! Thanks for sharing at the Blog Hop Blitz! Great hop! Thanks for visiting! Love your hop! I’ll be back again today! I’m so excited about the feature! I’ll be sharing your blog hop now!